An essential recipe for those times when you want to cut out a biscuit and for it to stay in shape! 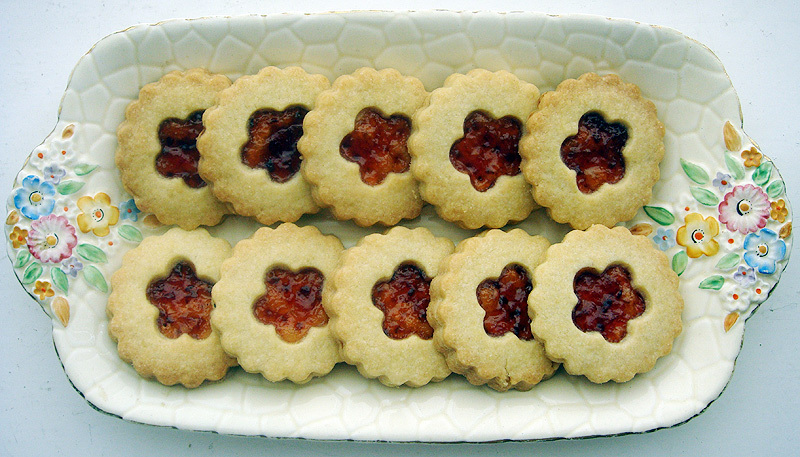 Good for making your own Jammy Dodgers. Beat the sugar into the soft butter, either with a wooden spoon, or food processor. Sift flour and mix until the dough comes together in a ball. Roll out on a floured surface to about 5mm thickness and cut out shapes. Arrange on greased tray, or use non-stick liner. Bake gas 4, 180c for about 15 mins, until pale golden. Don’t remove from baking tray when too hot or they will fall apart. Leave to cool for a few minutes and then cool thoroughly on a cooling rack. 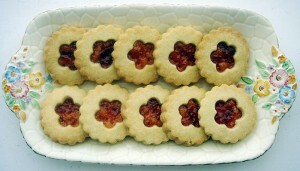 This is also a good recipe for jammy dodgers. You have to roll the dough slightly thinner (3mm). Cut the bottom shapes. Prick with a fork. Spread with jam. Cut out top shapes, which should be the same as the bottoms but with a hole in the middle. This recipe is very easy to make bigger batches. Notice the 1,2,3 ratio of sugar, butter, flour. You just have to double, triple etc to get the desired amount.